If your business has a foreign entity you must get Transfer Pricing right . A transfer pricing study will help inform what level of profit you should be reporting in the US entity and the level of Corporation Tax that should be paid. Transfer pricing is the general term for the pricing of cross‐border, intra‐firm transactions between related parties. In layman’s terms, transfer pricing is about profits and tax. Given that tax is typically paid on profits and the US Corporation Tax rate is 39 per cent compared to 20 per cent in the UK, it would not be surprising if companies with a US and UK entity held their profits in the UK where the tax level is lowest. A lot of people would complain about this! In comes transfer pricing, which is there to determine the profitability of connected entities. A transfer pricing study lays out the level of payment a subsidiary or member of a group should be paid for its services by another member of the group. Transfer pricing regulations vary from country to country. 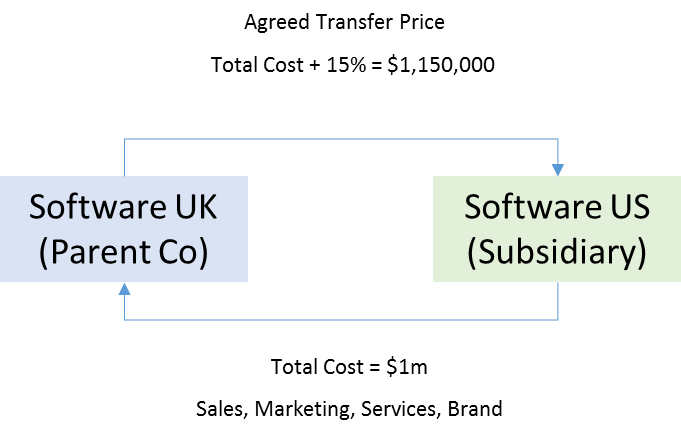 A business produces software in the UK (Software UK), and distributes it via a US subsidiary (Software US). It would be in the interest of the Software group, to only generate a profit in the UK where the level of taxation is currently lower. Software US offers its services to Software UK to market and distribute products, and is able to charge the UK business for this service. A transfer pricing study would set the level at which the US company must be paid for its services. Software US has five employees and a limited infrastructure which will cost $1M per year to operate. A transfer pricing study would typically set a mark-up on the cost-price which must be paid to the US Company by the UK parent company. If the study sets the mark-up at 15 per cent, this would mean that Software US would recharge Software UK for its cost ($1M) but with the additional mark-up (15 per cent = $150k) meaning that Software US would return a small profit ($150k). This would be liable to US Corporation Tax. In this way, transfer pricing would prevent a wildly successful business conducting significant operations in the US but not paying the tax it should in the US. When to think about transfer pricing? When submitting annual tax returns to the IRS, you will need to show whether the US business has generated a profit and what level of tax is payable. As a result, putting in place a transfer pricing study can be a pre-requisite for submitting annual accounts in order to arrive at the profit/loss number. Given that many start-ups will be eligible for tax deductions and refunds, it is possible that, even if a small profit is being generated, no Corporation Tax will be payable. Some companies will combine producing a transfer pricing study with setting up in the US or at least complete the study in the first 12 months of trading in the US. The nature of the relationship between the UK and US entity and manner in which goods/services are transferred will decide how important transfer pricing is for your business. For some businesses this needs to be decided at the point that trading starts and for other businesses it can become more relevant after the first year. How is a transfer price calculated? A core principle in transfer pricing is acting at “arm’s length.” Given that the whole purpose of transfer pricing is to replicate a level of profitability that would happen without the bias of a group structure, it makes sense that the price is calculated using third-party, unbiased data. The “arm’s length” principle is formally set out in U.S. Internal Revenue Code (“IRC”) § 482 and the Organization for Economic Cooperation and Development Transfer pricing Guidelines for Multinational Enterprises and Tax Administrations (“OECD Guidelines”). This lays out a methodology for what level of profitability would be expected for a given company completing specific activities without any overseas complications. In the software business example, this would mean that Software US can re-charge the UK entity for all costs incurred with a 10–20 per cent mark up on cost. It is very likely that the transfer pricing study will not be scrutinised by the IRS but in the event that it is, many companies see the value in having a well-respected global accountancy firm such as KMPG, Deloitte or PwC produce the study in order to allay any suspicions if the IRS does challenge it. Any transfer pricing study is only as good as the data which it was based on. As a result, transfer pricing studies will typically include a comment that it is subject to updates. With this in mind, some companies find it prudent to get updates to its transfer pricing study every two to three years or if the nature of the business activity changes. The exercise of completing a transfer pricing Study, depending on the complexity associated with it, can carry a cost of $10–30k depending on the provider. Keep on top of where IP sits within your business and how this may affect transfer pricing as licencing the IP may only be defensible as long as the US is not generating IP. Please send us your thoughts on the above, especially if your experiences differ from what we’ve shared. Alternatively, feel free to email me or Alliott directly. Thanks to Katherine Grover at Semafone, Keith Lovell & Johnathan Hague at Antidote for helping share your knowledge and experience on this topic.